Patients with receding gums around Pomona, CA, are now welcome to visit Dr. Jin Kim for experienced gum grafting care, with or without a referral. As an experienced and world-renown periodontist, Dr. Kim specializes in treating cases of gum recession and offers a variety of treatment options at his two practice locations in California. Healthy gums protect tooth roots from damage, hold the teeth firmly in place, and attractively frame the smile. Experienced periodontist, Dr. Jin Kim, is now welcoming new patients from Ponoma, CA with receding gums to his practice, with or without a referral, for a specialized gum graft treatment. Those who suffer from gum recession are more susceptible to tooth damage, decay, loose teeth and even tooth loss as the gum tissue pulls away from the tooth itself and exposes the sensitive roots. In order to protect the tooth roots, gum grafting is commonly used to cover the area of recession and restore the gum tissue. Gum recession is a common occurrence and affects most people at some point in their lifetimes. A common reason for recession is periodontal (gum) disease, which causes the gums to pull away from the teeth due to excessive bacteria and infection. Trauma to the mouth or aggressive brushing and flossing are also reasons for the gums to recede. The gums will not grow back on their own, so treatment is necessary to return the mouth to a healthy level again. These gum graft techniques take tissue from the patient’s mouth, either from the palate or gum tissue surrounding the affected teeth and use it to cover the exposed roots. After tissue will be placed and the area is allowed a healing period, it will fuse to and blend seamlessly with surrounding gums. Healthy gums protect tooth roots from damage, hold the teeth firmly in place, and attractively frame the smile. Those interested in receiving treatment for receding gums near Pomona, CA, can find out more information by calling 909-860-9222 for the Diamond Bar practice or 714-898-8757 for the Garden Grove location. Appointments can also be made by visiting the practice’s website at http://www.drjinkim.com. 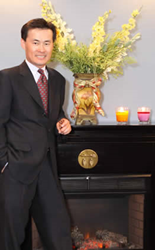 Dr. Jin Y. Kim is a periodontist dedicated to providing personalized dental care in Diamond Bar and Garden Grove, CA. Dr. Kim attended the University of Sydney Faculty of Dentistry before furthering his education with an advanced degree in pathology from the Medical School of the same University. Dr. Kim completed a periodontics and implant surgery residency at UCLA School of Dentistry and is board-certified by the American Board of Periodontology and the American Board of Oral Implantology/Implant Dentistry. He is a past president of the Western Society of Periodontology and was also inducted to be a Fellow of the prestigious American College of Dentists and earned Fellowships in the International Congress of Oral Implantologists and the American Academy of Implant Dentistry. Dr. Kim lectures and holds faculty positions at a number of universities including UCLA School of Dentistry and abroad. He has spoken at no less than 36 different countries across the globe as well as national and international academic and clinical associations and universities including the International Association of Dental Research, American Academy of Periodontology and Academy of Osseointegration. To learn more about Dr. Jin Kim and the services he offers, visit his website at http://www.drjinkim.com or call 909-860-9222 for the Diamond Bar location or 714-898-8757 for the West Garden Grove location to schedule an appointment.